~To live, love, and journal our days at~ : When will I ever learn? 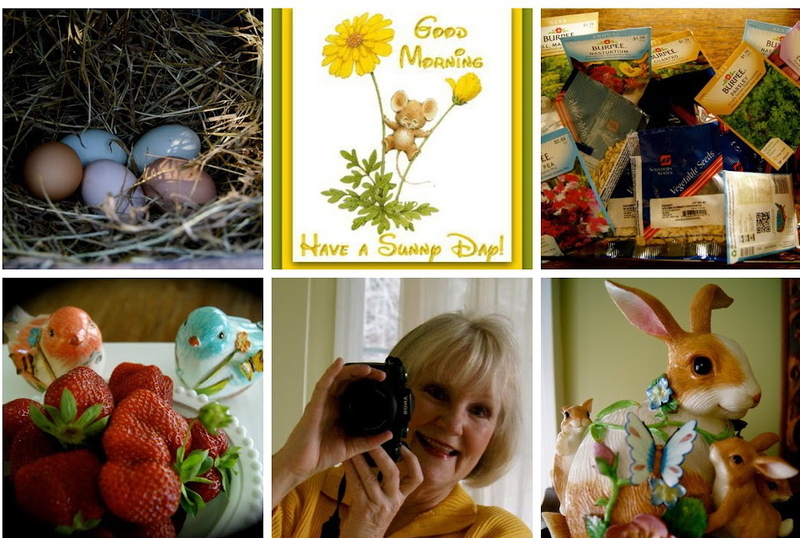 Written by Sue, Monday, April 8, 2019 rain, temps., 80 degrees Wow! Saturday was errands day, Tractor Supply is one of our favorite stores, we are always looking for bargains, wow, did we ever find one, it was on potting soil, just in the nick of time too! This is the week we will be making our hanging baskets for the porch, we are a little late this year, this photo is from last year! I haven't decided if I will go with ferns or wave petunias, I will know when by the end of the day. I think spring has decided to stay, it will be 80 degrees today.Yay! Getting back to the great bargain, we found Miracle Grow 1cu.potting mix for two dollars, regularly priced at 8 to 9 dollars, a savings of 6 or 7 dollars. I figured what we saved will cover the cost of the plants! Yay! why am I sitting here with a brace on my hand? Usually Tractor Supply will have men to load heavy material, but not Saturday, it was a woman who came to load, because of knee problems Mr P. cannot bend, so I volunteered to help her load 22, 34lb. bags, in my enthusiasm of such a deal I didn't realize the effect it would have on my already touchy wrist. Nothing hurt, until I was home, and was about to take a shower! Ouch! I could hardly move my hand especially my wrist. So Dh and I backtracked on what could have caused it, voila' the loading of the bags. 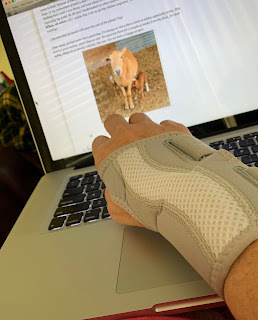 For now the brace helps with mobility, and I am feeling so much better. When, oh when will I realize that I am no spring chicken anymore. 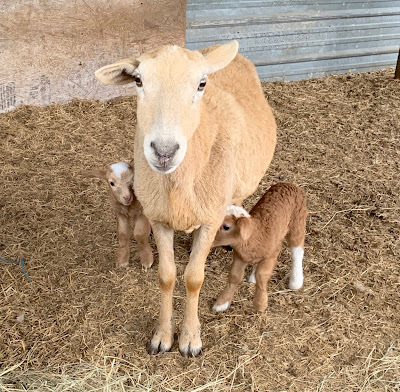 Other news, we had twins born yesterday, it's always so nice when a lamb is added, especially twins, This ewe is a good mother, aren't they cute. We separate them for a couple of weeks from the flock, for their safety so they aren't stepped on, sheep are so family oriented, this ewe has not been a happy camper. Sometimes just a "smile", a "how are you", or "a kind word" will lift someone up, and let them know you care. I am so sorry about your wrist. I am the same as you...I forget in the moment I am not as young as I used to be!! My body reminds me later! Your babies are soooo precious! Enjoy your beautiful spring day, my friend! I love your life! And, no.....I don’t think we will ever learn! That’s just the way it is! So sorry about your wrist. The thing is that one must also unload the goods. I no longer unload heavy things from my cart at grocery stores...so much carting! ☺️ You sure did get a great deal and I will pray that your wrist heals quickly. I wonder what you will decide for that porch plants. We are in the middle of a snowstorm. One could despair that spring will ever arrive here. good luck...you have good bargain for "miracle grow"
I'm so sorry to hear you are having problems with your wrist. I find I try to do the things I've done all my life and bam, my body rebels! I'm looking forward to seeing your plants all potted and pretty! It's sure an exciting time of year. The darling lambs are simply beautiful. Feel better soon! Oh gosh, Sue, I am so sorry, about your wrist. I hurt myself last week working so hard, and I thought the same thing. I am no spring chicken anymore what on earth am I doing. 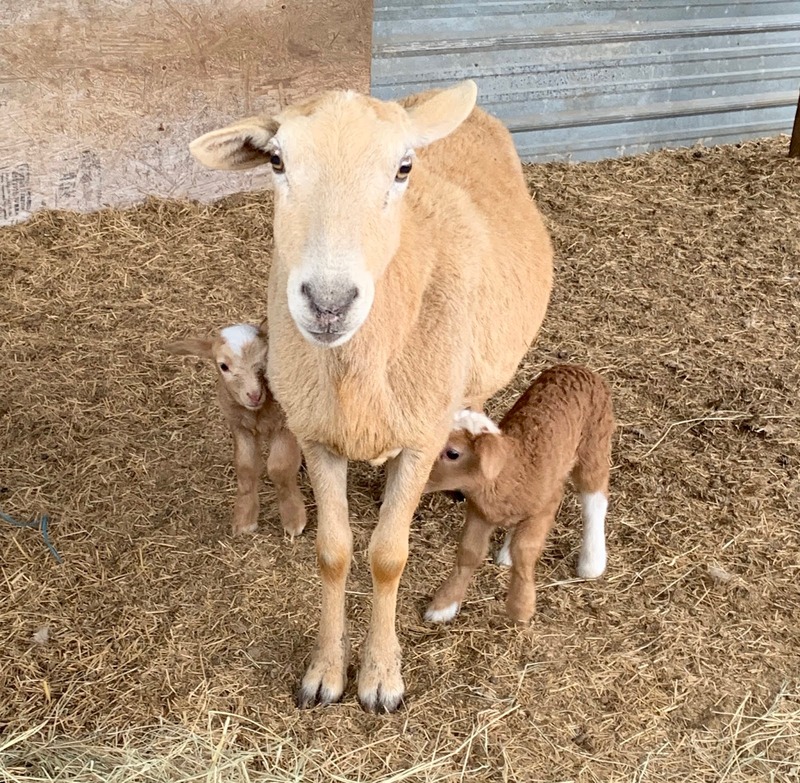 I love the picture of that ewe and her babies. She sure has a look doesn't she. I hope your wrist is back to normal soon, and my goodness what a deal that was. I do love Tractor Supply. Oh so sorry about your wrist. The twins are adorable, sooooo cute. Oh, Sue my little sheep showing Grandson would get so excited over those twin lambs. Wish I could bring him over to see them. And, boo to your hurt wrist. I am so sorry and hope it heals up quickly. Have a great week! Oh I am sorry about your hand! But what a deal. Those babies....how sweet. I'm sorry about your hand and hope resting it soon helps it to feel better. It sounds like you are getting into the rhythm of the season with gardening and all. Enjoy it, but don't overdo! That's a great savings but sorry your wrist hurts. That was a lot of work!! Oh my word, those lambs are so precious. Have a lovely day. So very sorry to hear about your wrist. I don't think there's ever a good time to injure one's wrist ... we use them for so much. Yet for whatever reason God allowed this injury; maybe just as a simple reminder not to overdo. The lambs are completely adorable! Hi Sue~ I really do miss blogland sometimes and wish I could just jump back in. But I think I miss my friends more then I do the writing of my own posts. I think all of mine were always soo similar that they were seeming meaningless. But.....first of all sorry to hear about your wrist! Praying it heals up quickly for you. And yes, we are not spring chickens anymore. I am afraid I am way more incapacitated then most as my knees too would have kept from picking up the bags in the first place. It is soo frustrating to me sometimes to feel YOUNG on the inside but my body doesn't cooperate anymore. I wish I could get a big hanging fern for my front porch but I think there is simply too much sun as they never do well. Or maybe it's their keeper, lol. I soo dont have a green thumb. I WISH I could come over and watch you work and learn a thing or two. Looking forward to seeing your finished porch! Mel's pet goat just had twins about a month ago but they lost one and her kids were soo sad. It hadn't done well from the beginning so the boys were added it to their nighty prayer list. Little 5 year old Luke told Melody the night the goat died, "well, we asked God to make him better....I guess His answer was no. Why do you think God said no mom?" What a question. Melody told him, "Well I guess I don't know for sure Luke. Only God knows that. But I am thinking maybe He loved him lots too and just decided to have him come live with Him. Now he won't ever get sick again." Luke seemed to accept the answer. What a different life it is living on a farm, but its been full of life's lessons that's for sure. Have a GOOD week Sue! Oh dear girl! I'm with you on not being a Spring Chicken anymore and pacing myself. I do hope your wrist will settle down and heal quickly. Sweet twins, so cute! bargains are always great and they bring much excitement. I sure hope your hand gets better quick. Awe..the little twins are precious!! I sure love all that Spring brings.. I'm so sorry about your wrist! I hope it heals quickly, or at least stops hurting! I always think I can do things that I could do when I was a young woman, and I always pay for it. What a great bargain though! I can't wait to see your beautiful hanging baskets! It's still too cold here to plant flowers, but I do need potting soil for some inside plants, I'll have to check my local tractor supply store, there's one right down the road from me! I agree with, Maya, people will always remember a friendly smile and a kind word! Ouch! That must of hurt. I hope you are better now. Thank you for cheering and encouraging my daughter, Kimmy. She was pleased to know some of her mother's friends were praying for Lulu. I am late to comment, so I hope by now that your wrist is better. I, too, am discovering that my body does not work the way it used to. My granddaughter is going to show lambs at the fair this season...a first for her. I'm excited to see the one she chooses. Take care and have a great weekend!